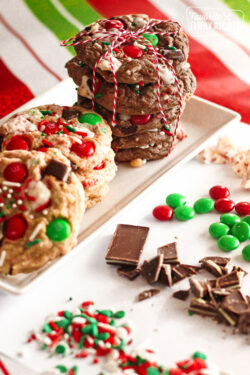 These Andes Mint Cookies are sure to get you on the nice list if you leave them out for Santa! 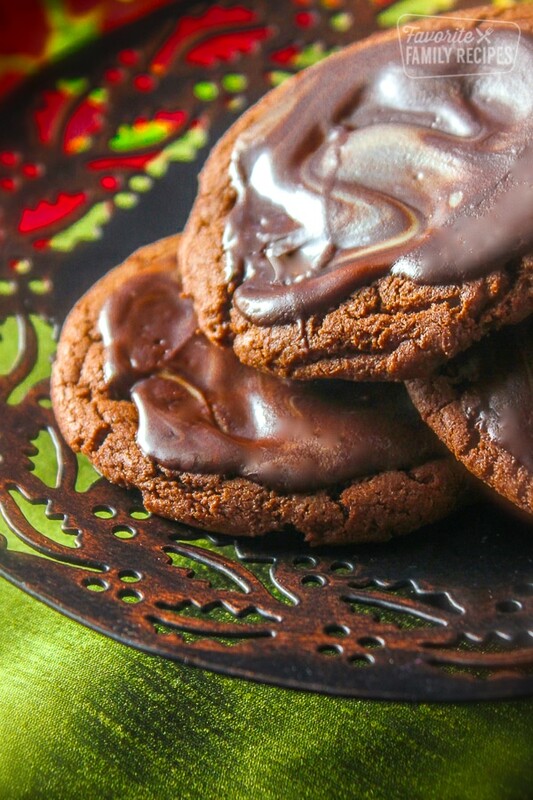 They are a chewy chocolate cookie with a chocolate Andes mint melted and swirled over the top. 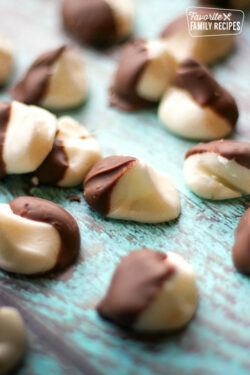 Andes Mint Cookies are a delicious holiday dessert that I got from my husband’s family. It’s one of his FAVORITE all time cookies! These are perfect for the Holiday season since they are such an easy chocolate dessert. We have taken them to parties and given them to neighbors; they are always a hit. In fact, my husband took them to work last week and the entire batch was polished off. These cookies have actually been on our site for years but definitely needed an updated picture. So I thought it would be fun to re-feature them. They are just too good of a holiday dessert to get lost in the archives! This is a great chocolate cookie base! 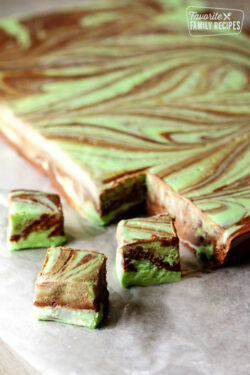 If you are not a mint fan, try melting and swirling a Rolo candy over the top instead to create a chocolate caramel cookie. I have also used our coconut pecan topping from our german chocolate fudge recipe HERE to make a german chocolate cookie and that is amazing too! We have so many cookie recipes that we love in our family, it’s always hard to decide which one to make! If you are looking for more yummy cookie ideas be sure to check out our full list of cookies and cookie bars HERE. Need some other holiday dessert ideas? I love all the yummy treats that our family makes around the Holidays. 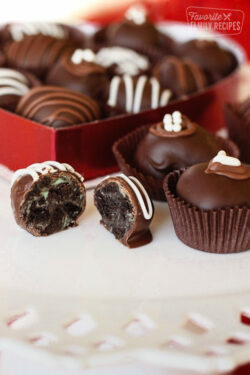 These Andes Mint Cookies are just one of our favorite Christmas treats. You can find the list of all our favorite treats for Christmas HERE. It has some amazing sweets that are perfect for neighbor gifts and Holiday parties, like homemade caramels, peanut clusters, cinnamon almonds, german chocolate fudge, peppermint bark brownies, and many more easy chocolate desserts! Heat butter, sugar, corn syrup, and chocolate chips in a small saucepan until chocolate chips are melted. Remove from heat and pour into a large mixing bowl and add flour, baking soda, and salt. Then beat in eggs one at a time. Shape rounded tablespoons into balls and place on a cookie sheet. Lightly press each ball to flatten. Bake at 350 for 9-11 minutes. Right when removing from the oven, while still hot, place one to two Ande's Mint on top of each cookie (I like to do two). When they melt smooth the chocolate evenly over the top. Cool completely at room temperature and let chocolate harden before serving. These cookies are one of my very favorites too! I make batches and batches of them for the holidays. The recipe I use calls for 2 T. water, instead of white corn syrup. Maybe a little healthier? Thanks for sharing this amazing recipe with everyone. So yummy! It’s 12 ounces. Thanks for clarifying. I’ll make a note on the recipe.